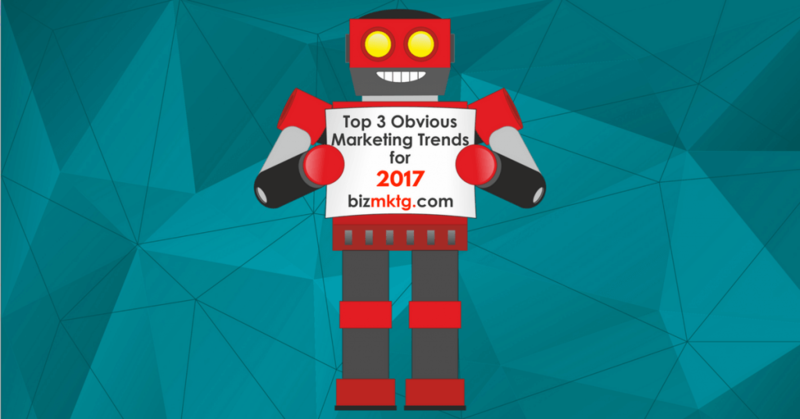 Why should your business care about digital marketing trends that are obvious? Because everyday we see businesses missing out on opportunities to win more new clients and grow their business because they fail to exploit the opportunities afforded by these obvious trends. The Facts: 220 million smartphones will be in use in the U.S. in 2017 (1). About 90 million of those smartphones will be Apple iPhones (2). And in case you’re wondering, the iPhone was originally launched nearly ten years ago, on June 29, 2007. Pew Research Center found that 92% of adults in the U.S. aged 18-34 own a smartphone and 72% of all U.S. adults own a smartphone (3). The impact of high-end smartphone ubiquity – Now 60% of all web searches are from smartphones (4). The reason? Instant gratification! We now want answers faster than ever. Now the quickest way to find an answer is to pull your phone out of your pocket or purse and search. Businesses that ignore smartphone users are at risk of getting overlooked or worse, being invisible to potential new customers and not getting their share of new business. Impact on your website – You may be missing new business because your website is not fully optimized for smartphone users. Even if your website is already “mobile-responsive” (which means it changes automatically to fit on a mobile phone screen) it may still not be easy to use. And if you haven’t had your website speed optimized, visitors to your website might move on before your website has even finished loading its first page. Here’s a quick test. Pull up your businesses website on your smartphone and see how easy (or hard) it is to figure out what your business does and how to contact you. If you found it hard, imagine how your potential customers feel. To get things fixed, we recommend that your businesses work with a professional web developer rather than trying to do-it-yourself. With so many security breaches and ever changing technology, the days of DIY websites for business are over. Phone Number on your website – Make sure your businesses phone number is easy to find and clickable on your website. Your phone number should be shown in the top part of your website in a large font. Make sure your phone number is formatted as a clickable link that opens their phone app when they click on it. 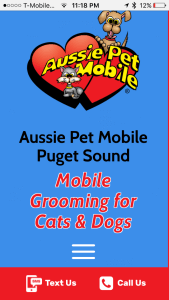 Another effective option is to place your phone number in the footer of the mobile view of your website, with a “Call Us” link as seen in the example below from Aussie Pet Mobile Puget Sound. Look for an example of the correct code in the reference section below. Text Messages for your business – Text messaging is the most frequently used app on smartphones with 97% usage among all smartphone owners in the U.S. (5) Research shows that 90% of text messages are read within the three minutes of receiving and the overall open rates are close to 98% (6). With everyone sending and receiving texts, its time your business got in the game. One easy way to get started is to add a “Text Us” button to your website. If your phone number is SMS text-enabled, then you’ll start getting texts. See the code in our reference section below for example code. One of our local service business clients recently added text messaging capabilities to their website and saw immediate results, booking three new client appointments within the first 24 hours of adding it. Text Messaging for business phone numbers – There are several options for sending and receiving text messages for business. If you don’t want to use your personal phone number for business related texting, a relatively new service allows businesses to utilize their existing business phone number for sending and receiving texts. The service is offered by Zipwhip and is available for most business phone numbers. Receiving and responding to text messages is handled through a dashboard on a web browser. The Facts: 79% of online adults in the U.S. now use Facebook. That number was only 11% ten years ago, according to the Pew Research Center (7). Even more astounding are the usage rates of social networking, with 76% of Facebook users logging on daily and 55% visiting Facebook several times a day (7). A social marketing strategy is no longer optional or a “nice to have” for most businesses. Every business must face up to the opportunities created by social networks. Quickly reach existing customers – Most businesses are looking for ways to stay in touch and top-of-mind with their customers. Facebook and other social networks provide an easy way to get branded messages out to customers. Whether it’s an upcoming event, sale or update about a new service, social networks are hard to beat for their immediacy and relative cost versus traditional methods of advertising such as newspaper, mail, radio, or TV. In less than a day, a business can plan and execute social media campaign that reaches hundreds or even thousands of customers. Find new customers – While social networks have long promised to help businesses find new customers, most of those promises were broken due to limited targeting options, ad formats and platform inflexibility. Those limitations have been largely removed. Now nearly anything is possible on social networks. Facebook offers several ad types including video, carousel with 2 or more scrollable images or videos, slideshow with up to 10 images. They also offer targeting users by geography, gender, age, interests, activities, the Pages they have liked and closely related topics. We recently used Facebook and Instagram to successfully promote a new showroom open house event for one of our clients. We had less than two weeks to plan and execute a campaign to attract new customers to the event. On the day of the event, our client happily reported their showroom was full of new customers and had been for most of the day. The Facts: 84% of people now trust online reviews as much as a personal recommendation per a survey conducted by BrightLocal. The survey also found that 74% of people say that positive reviews make them trust a local business more. It also found that 37% of people go directly to reviews sites such as Yelp to read reviews (8). Like it or not, online reviews are here to stay and businesses must take a proactive approach to managing online reviews. Failing to monitor and manage online reviews for your business is like driving a car without a speedometer, you may think things are OK…until you hear the siren and see the lights in your rearview mirror. Searches for your business name – When people search for the name of your business, marketers call it a “branded search.” Branded search is the most common type of online search for local businesses. When people google the name of a business, the search results will nearly always show reviews and star ratings for that business from Google reviews, Yelp reviews and other websites. If your business has mainly positive reviews then the search results will help your business, however, if the reviews are negative, then the search results may be devastating to your future business. 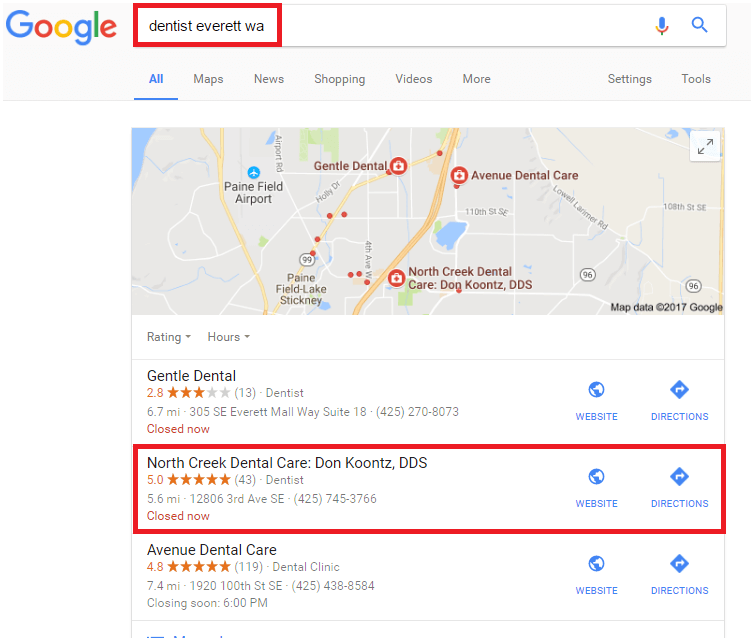 See an example of a business (North Creek Dental Care Everett WA) with many positive reviews below. Apple Maps show Yelp Review results – If your business has a physical location customers come to, then it is very important to have positive Yelp reviews since Apple Maps show the reviews from Yelp. If a business has bad reviews or no reviews, it’s likely they won’t show up in the search results. Receive more positive reviews – We create a simple reviews web page for your business. Customers are invited to visit the page to review their experience with your business through email and “review cards” (included with our service). The page contains links to various third-party review websites such as Google, Facebook and an internal reviews system too. Monitor reviews – Reviewsof.us monitors all the major third-party review websites. You are alerted when any new reviews (positive or negative) show up. Stream reviews on your website – Reviewsof.us allows you to stream positive reviews from our internal reviews and other source directly to your website. Potential customers can read reviews directly on your website. bizmktg.com provides online marketing solutions to dentists, doctors, lawyers, home service contractors, automotive repair shops, and franchisors. We are based near Seattle in Edmonds, WA and serve clients across the United States. Want to learn more about Reviewsof.us and bizmktg.com’s full range of online marketing solutions and how we can help your business win online? Ubiquity of High-End Smartphones – Everyone has a smartphone, businesses must respond. Social Networks – Ready for Business – Everyone uses social networks, businesses should too. Online Reviews- Trusted Now More Than Ever – Everyone trusts reviews, be proactive or fail.